Background: The use of lytic bacteriophages for the biocontrol of food borne pathogens is gaining interest. In recent years it has become widely recognized that bacteriophages have several potential applications in the food industry as a biocontrol agent. Seafood industry is still using chemicals to control the food borne bacterial pathogens which may adversely affect consumer health. Hence this study has been under taken to control food borne Salmonella infections in peeled and deveined (PD) shrimp using bacteriophage. Methods: Salmonella phage was isolated from raw sewage sample by using Salmonella typhimurium (MTCC 1264) as the host bacterium. The host range specificity of Salmonella specific bacteriophage isolated in the current study was checked using different bacterial strains by spotting technique. The efficacy of the isolated Salmonella phage as a biocontrol agent against Salmonella was checked by conducting challenge experiments in PD shrimp by collecting samples from all the controls and treatments at four time intervals viz.0th, 3rd, 6th, 9th h.
Findings: The results showed that the log reduction between the positive and treatment trials at 0th and 3rd hour interval as 0.24 and 0.95 log unit respectively (p>0.05). But from 6th hour onwards the host bacterial count showed high reduction in Salmonella count when compared to 0th and 3rd hour (p<0.05). At the 6th hour, the Salmonella count obtained for the positive control was 3.08×103 cfu/ml and for the treatment, the bacterial count was 1.4 × 101. The log reduction in host bacterial count between the positive and treatment at 6th hour was 2.34 whereas at 9th hour the log reduction was 2. 51 log unit (p<0.05). Conclusion: Hence the study shows the potential effectiveness of this isolated Salmonella phage as a biocontrol agent of Salmonella typhimurium in PD shrimp. Shrimp is the one of the most important seafood, contributing to about 19% of international trade in value terms and holding leading markets worldwide (MPEDA, 2015). In the export market the buyers insist on high quality and due to Modified Inplant Quality Control (MIPQC) the situation is improving (Badonia et al., 1988) towards a chemical free natural substitute era. One of the most important quality problem associated with seafood industry is microbiological hazards which leads to a huge loss of seafood processing industry as well as it is of great public health significance which needs to be taken care. The frozen shrimp exported from India has faced many problems in the past such as high bacterial count in the cooked and peeled frozen shrimps, as well as the presence of Salmonella, Vibrio, Staphylococcus (Huss,1994). The microbial hazard identified are high bacterial load associated with the raw material, cross contamination of the meat from the raw material, as well as from the workers hand during peeling, microbial growth of possible psychrotrophs due to improper freezing etc. Seafood products can become contaminated with Salmonella through the use of unsanitary ice, water, containers, and poor hygienic handling practices (FAO, 2010). In shrimp processing industry, the principal sources of Salmonella contamination are culture ponds, coastal water used for handling and processing of seafood (Hariyadi et al., 2005; Shabarinath et al., 2007; Upadhyay et al., 2010). Presence of Salmonella in fish and fishery product is therefore seen as a sign of poor standards of process hygiene and sanitation (Dalsgaard, 1998). In processing plant, antibiotics have been the best choice to control or treat bacterial contamination but frequent use and long term exposure to antibiotic in an uncontrolled and unfashionable manner are hazardous to consumer health (Karunasagar, et al., 1994). Like any other biocontrol measure, the Bacteriophage therapy also reduces the use of chemical agents against pathogens as phages are target specific and it is easier to develop new phages than new antibiotics (Fujiwara et al., 2011). A time period of only a few days or weeks is needed to acquire new phages for resistant strains of bacteria, whereas it can take years to obtain new antibiotics. When resisting bacteria evolve, the assigned phages also evolve and so when super bacterium appears, an equivalent super phage fights it as long as the phage is derived from the same environment. Compared to antibiotics or chemical treatment phages go deeper into the infected area. Antibiotics, on the other hand, have concentration properties that quickly decrease as they go below the surface of the infection. The replication of phages is concentrated on the infected area where they are needed the most, while antibiotics are metabolized and removed from the body. In addition, secondary resistance does not happen among phages, but happens quite often among antibiotics. Secondary resistance is acquired and occurs when there aren’t enough blood drug levels (Fujiwara et al., 2011). When a virulent phage or lytic phage infects a host bacterium, it replicates much faster than the host cell. The whole cycle can be completed in 30–40 min. The phage is a parasite that depends on the host for its propagation, which is influenced by a variety of factors such as temperature, nutrients, light and other environmental forces (Jassim and Limoges, 2013). It subverts the host’s biological function and utilizes the host machinery for reproduction. The host cell undergoes lysis and dies, simultaneously liberating a large number of progeny phages, each of them are then ready to start another cycle by infecting new neighboring bacterial cells. This cycle is known a lytic ‘virulent’ cycle. This lytic cycle or ‘virulent phages’ fit in the class of ‘natural antimicrobial controlling agents’ and are arguably the most abundant biological entities on the planet. Hence, this of study aimed to evaluate the efficacy of Isolated Salmonella phage to kill Salmonella typhimurium inoculated in PD shrimp through a challenge experiment. Bacterial strain of Salmonella typhimurium MTCC 1264 (from Microbial type culture collection, Chandigarh) was used to experimentally contaminate the sample. As soon as the freeze dried culture was received, sub culturing was done based on the protocol of revival of culture provided by MTCC. This study was performed with sewage sample collected from the influent raw urban sewage from Eraveli Canal situated at Kunnumupuram, Fort Kochi. Samples were collected aseptically in a screwed glass bottle and brought to the laboratory with following all precautionary steps for phage isolation. The method followed was as per Cappuccino and Sherman (2012). The collected sewage sample was used for the isolation of phage on the same day. Aseptically 5 ml of Luria Bertani (LB) broth (Merck), 5 ml of Salmonella broth culture (24 h old culture) and 45 ml of raw sewage sample were mixed in appropriately labelled sterile 250 ml Erlenmeyer flask and kept for incubation at 37°C for 24 h.
Filtration and seeding were done by the method described by Sambrook and Russel (2001). Following incubation the phage infected culture was centrifuged by using a centrifuge (Remi- R12-M model) at 2500 rpm for 20 min. Centrifuge tubes were removed after 20 min without stirring the sediments and carefully decanted the supernatant into 125 ml conical flask. Supernatant solution was then filtered by using 0.22 μm sterile membrane filter apparatus to collect the bacteria free phage. The presence of bacteriophage was determined by soft agar overlay technique described by Adams (1959). Accordingly, 100 μl serially diluted enriched filtrate and 100 μl overnight grown culture of Salmonella typhimurium containing 103 cfu/ml cells (concentration was adjusted by measuring the OD600) were added together into an aliquot of 5 ml molten soft LB agar (LB broth containing 0.5% agar powder), mixed well and then poured onto the already prepared LB agar plates. After the top agar had set, the plates were kept for overnight incubation at 37°C until clear plaques were visible. The Salmonella phage plaques obtained by plaque assay was harvested by the method described by Sambrook (2001) with minor modifications. 5 ml of SM buffer was taken in a sterile centrifuge tube of 15 ml volume and 1 drop (50 μl) of chloroform was added. With the help of a micro pipette the plaques along with underlying hard agar were sucked and placed into tube containing SM buffer was kept for 2 h at room temperature to allow the bacteriophage particles to diffuse from agar. To assist the elution of the phage particle, the tubes were gently shaken and centrifuged at 4000 rpm for 10 min. The supernatant containing bacteriophage was collected and stored at 4°C. The harvested phage preparations were used for purification of bacteriophages (Sambrook and Russel, 2001). 100 μl of resuspended plaques were dispensed into overnight grown Salmonella typhimurium culture and incubated for 6 h at 37°C. The enriched content was centrifuged and filtered through 0.45 and 0.22 μm PVDF membrane filters (Millipore). The resultant filtrates were serially diluted and checked for the presence of plaques. All the above steps were repeated twice to get well purified homogenous lysates. Titres were determined, confluent plaques were harvested, labeled and stored at 4°C with chloroform. This resultant filtrate known as ‘primary lysate’ was stored for further enrichment and stock preparation. A single plaque having typical morphology was considered as a single phage based on their size and morphological characteristics. Properties considered of isolated Salmonella bacteriophage were their size and morphology. Host range of Salmonella phage was determined by the method described by Kutter et al. (2009). 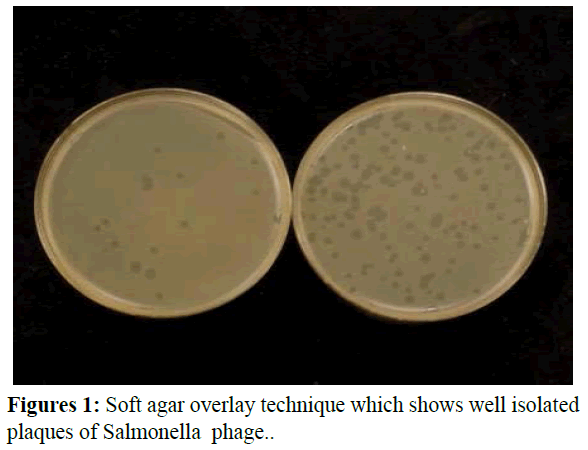 The host range specificity of Salmonella specific bacteriophage isolated in the current study was checked using different bacterial strains maintained in the microbiology laboratory of School of Aquatic Food Products and Technology, Kerala University of Fisheries and Ocean Studies i.e. Salmonella typhimurium MTCC-1264, Escherichia coli, Vibrio parahaemolyticus, Vibrio sp, Vibrio cholearae, Salmonella sp, Staphylococcus sp, Staphylococcus sp, Listeria monocytogenes and Vibrio sp (Table 1). Overnight cultures of Salmonella typhimurium (MTCC-1264) and other isolates of different bacterial strains were prepared in LB medium and then sub-cultured by addition of 100 μl to 3 ml LB broth and grown at 37°C for 90 min. 100 μl of sub-culture was inoculated into 3 ml of molten LB top agar and overlaid onto LB agar plates. Each overlay was allowed to solidify for 15 min. The phage lysate (original titers approximately 108 pfu/ ml) was diluted in 10 fold increments and 10μL of each dilution was spotted onto the bacterial overlay, dried, and then incubated at 37°C overnight. As a control, each bacterial strain was also mock infected with sterile phage buffer. Results were analyzed based on detection of any lysis and further dilutions were checked for single plaques to ensure phage lysis. All spot tests were repeated in triplicate to confirm the results. Table 1: The bacterial isolates used for the host range analysis of Salmonella phage. High titre phage stock was prepared by the method described by Carey-Smith et al. (2006). Purified phages were diluted serially in SM buffer to give a concentration that would provide confluent lysis of the host in a soft agar overlay plate. For each dilution 2 plates were overlaid and, after incubation, plates with almost confluent lysis were chosen for the preparation of high titre phage stock. To recover the phages from the plates 5 ml SM was added to each plate and left at room temperature for 1 hr. The liquid was decanted into centrifuge tubes containing 20 ml SM buffer (Adams, 1959), and the soft agar overlay layer added to the tube after scraping from the base plate. The contents were mixed by vortexing before shaking for 30 min, and the overlay was removed by centrifugation at 4000 rpm for 10 min. The supernatant was then filtered using 0.22 μm filter paper and 0.2% chloroform was added before storage at 4°C. The titre of the stock was determined by counting the plaques and expressed as plaque forming units (pfu) per ml. Where, d=dilution, v=volume of diluted virus added to the plate. Sample preparation and experimental design: PD shrimps were purchased from local fish market and brought to the lab in a sterile polypropylene bag aseptically and kept at 4°C in a polypropylene tray until used. The tray was previously disinfected with 70% ethanol and was UV treated. The overall microbiological quality of the PD shrimp purchased for the treatment trials were checked by total plate count technique. The sample was also screened for presence of Salmonella by pour plate technique on XLD agar. A total of 600 g sample was divided into 3 lots each containing 200 g which were transferred into three separately labelled polypropylene bags. The three samples lots served as negative control, positive control, treatment respectively. Where, negative control was only sample without bacteria, positive control was sample with experimentally contaminated bacteria and treatment was kept as sample along with experimentally contaminated bacteria and phage. Experimental trial: Overnight cultures of Salmonella typhimurium were diluted 1:10 in fresh LB medium, incubated for 2 h at 37diluted to achieve a count°C until an OD600 of 0.4-0.5 was reached. This culture was appropriately diluted to achieve a count of 103 cfu/ml. Positive control and treatment lots were experimentally contaminated with above inoculam at 1% of the sample weight (w/v) basis (Guenther et al., 2011) and was kept at 8°C for 1 h to absorb the bacterial suspension, whereas the negative control was mock treated with 1% sterile distilled water. The treatment slot was mixed with 2 ml of the phage solution at a concentration of 7 × 108 pfu/ml and 2 ml of the host bacterial suspension at a concentration of 1 × 103 cfu/ml, and kept in a laminar flow chamber at room temperature for 1 h for proper adsorption. After 1 h incubation 25 g sample was collected from each lot at 4 time intervals, viz., 0, 3, 6, and 9 h. Throughout the experiment all the control and treatment were kept at 8ºC. Analyzing the cell count difference between control and treated sample: All the samples including treated group of samples at assigned interval and control were homogenized. 25 g of each homogenized sample was placed in 225 ml of physiological saline (0.85% NaCl) in stomacher bag and blended for 2 min. It was then serially diluted and plated on XLD agar plate by spread plate technique after a incubation of 24 ± 2h at 35°C. For each dilution 2 plates were used and the average bacterial counts were expressed as cfu/g, was calculated for each time interval. Count was taken by using a dark field quebec colony counter (220V/50 Hz). Only those colonies which appeared as pink glossy colonies with or without black centers were taken into consideration. All the above steps were repeated twice to avoid any statistical error. The logarithms of the bacterial concentrations were determined for the treated and untreated groups in each experiment and the respective values subsequently compared. The database was created using the software: SPSS v. 20. The data was analyzed using ANOVA technique. The bacteriophage used in this work was isolated from the plaques obtained by the soft agar overlay techniques. The plaques chosen for host range analysis were phenotypically stable and of larger size, clear appearance with proper edge morphology and presence of halo around. Plaque size obtained was in a range of 1.5 -2 mm (Figure 1). One type of phage isolate was isolated in this study based on the size and morphology. It was fond this isolated phage was efficient enough to infect Salmonella strains during trial run. Figures 1: Soft agar overlay technique which shows well isolated plaques of Salmonella phage.. The Salmonella specific phage isolated in the present study was used for host range analysis with regard to their ability to form plaques against 9 bacterial strains as described in Section 2.6. Plates were assessed for the lytic ability of phage against each bacterial isolate by checking for clearing of bacterial lawns and all spot tests were repeated to confirm the validity of the results. All bacterial isolates were tested for host range. Clear plaques were obtained against Salmonella typhimurium MTCC-1264 (Figure 1). There were some opaque plaques observed over the mixed host lawn against Salmonella sp (SSELP12d) but it was not as clear and large as the plaque against Salmonella typhimurium (MTCC 1264). There was no plaque formation against Staphylococcus sp (STP121), Listeria monocytogenes (LIS32) and Vibrio sp (VIB01) (Table 2). Table 2: Host range of isolated phage. The viral titre is a quantitative measurement of the biological activity of virus (bacteriophage). The 10-7 dilution was chosen for calculating the phage titre as it resulted in plaques within countable range (30-300). The phage titre obtained for high titre stock prepared was 7.5 × 108 pfu/ml and this concentration of phage was used for experimental trials. Host cell reduction was checked with spiked isolated phage which showed gradual decrease logarithmic count over incubation hours (p<0.05) (Figure 2). 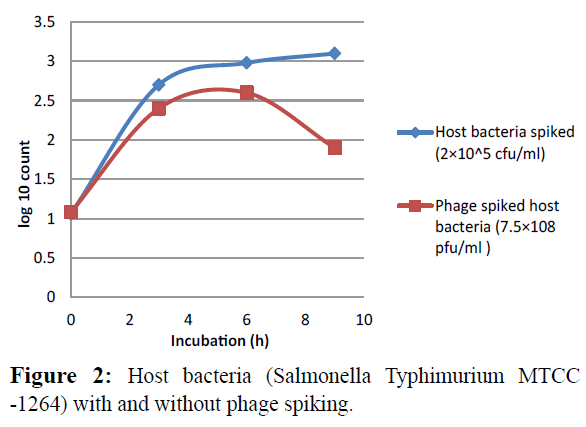 Figure 2: Host bacteria (Salmonella Typhimurium MTCC -1264) with and without phage spiking. The results showed that in the 0th h, the positive control showed a bacterial concentration of 1.87 × 103cfu/ml. As the time preceded Salmonella count followed an increasing trend. At the 3rd h the Salmonella count in the positive control showed a count of 2.45 × 103 cfu/ml (p<0.05). At the 6th h, it increased to 3.08 × 103 cfu/ml (p<0.05) at the 9th h count observed was 3.29 × 103 cfu/ml (p>0.05). Whereas in the case of treatment trial at the 0th h plate showed a count of 1.07 × 103 cfu/ml and as time proceeded treatment trial showed a decreasing trend of Salmonella count. At the 3rd hour it showed 2.7 × 102 cfu/ml (p<0.05). But a reduction happened at the 6th and 9th h. During this period of time bacterial count reduced to 1.4 × 101 and 1.09 × 101, (p>0.05) respectively (Table 3). Throughout the experimental trial the negative control did not show any growth of Salmonella typhimurium as it was mock treated with distilled water. The temperature used during treatment trial was 8°C as this is the normal house hold refrigerator temperature. Table 3: Reduction of Salmonella Typhimurium populations on PD shrimp by the application of a Salmonella phage. In the present study, attempt was made to isolate Salmonella specific phage from raw sewage using the above bacterial host without enrichment step. However, no plaques could obtain by soft agar overlay technique when the same sample was performing enrichment step and we could obtain nice lysed clear zone (well-formed plaques) in soft agar overlay technique. Hence, this phenomenon clearly indicates that to obtain a good quality and quantity phage from environmental sample, enrichment step is inevitable. Determination of host range specificity of a bacteriophage is essential to know what bacterial genera, species and strains it can lyse. It is one of the deﬁning biological characteristics of a particular bacterial virus (bacteriophage). In this study, phage host range was determined by spot testing method described by Kutter et al. (2009), where Salmonella specific bacteriophage isolated in the current study was checked using different bacterial strains mentioned earlier. The plates were incubated overnight at 37°C and examined for plaques. After incubation the uninfected bacteria multiply to form a confluent lawn of bacterial growth over the surface of the plate. Each infected bacterium bursts after a short time and liberates progeny phages that infect adjacent bacteria, which in turn are lysed. This 'chain' reaction spreads in a circular motion until brought to a halt by a decline in bacterial metabolism as discussed earlier Plaques forms clear zone of lysed bacteria on the lawns of bacterial cells. According to the clarity of the spot, bacteria were differentiated into three categories: opaque plaques (+), clear plaques (++), no plaque (-) as Salmonella sp (SSELP12d) maintained in lab was use as one of the bacterial strain so isolated Salmonella phage formed opaque zone against SSELP12d as it is highly host specific, it could not form well clear zone against Salmonella sp as it did on Salmonella typhimurium (STMTCC) but our isolated phage could not lyse other tested strains. Phage is specific for one species of bacteria and many are only able to lyse specific strains within a species. As it is highly host specific so during the bacterial-killing process phages are capable of increasing in number specifically where hosts are located (Carlton, 1999). Though there are some limitations such as dependence on relatively high bacterial densities (Skurnik et al., 2006; Abedon et al., 2010) which is also known as auto dosing. Hence, one of the major advantages of phage treatment is the phage specificity; bacteria that have been successfully infected by obligatory lytic phages are unable to regain their viability. Although there is advantage of high host specificity of phage, there is some deficiency as well. It was reported that Phage resistance may occur from mutations of the host bacteria that alters cell surface receptors, restriction modification, or abortive infection associated with the presence of clustered regularly interspaced short palindromic repeats (CRISPRs) in the bacterial genome (Allison and Klaenhammer, 1998; Barrangou et al., 2007). In this study it was not checked whether there is any presence of such CRISPR or not. The present study is consistent with published studies in which bacteriophages were used as biocontrol agents to control various food borne pathogens in different foods (Leverentz et al. 2000; Hungaro et al., 2013; Zinno et al., 2014). Leverentz et al. (2000) conducted study on bacteriophage as a biocontrol method for Salmonella on Fresh-Cut Fruit. They examined the effect of lytic, Salmonella-specific phages on reducing Salmonella numbers in experimentally contaminated fresh-cut melons and apples stored at various temperatures. They found that the phage mixture reduced Salmonella populations by approximately 3.5 logs on honeydew melon slices stored at 5°C and 10°C and by approximately 2. 5 logs on slices stored at 20°C, which was greater than the maximal amount achieved using chemical sanitizers. Hungaro et al., 2013 conducted study on the use of bacteriophages to reduce Salmonella in chicken skin and the result was compared with chemical agents. The samples of chicken skin was experimentally contaminated with S. Enteritidis were treated with phage cocktail or chemical agents and they found about 1 log CFU/cm2 reductions in bacterial load in both the cases. Our results suggest that bacteriophage may be applied to reduce Salmonella typhimurium in PD shrimp only after checking its lysogenicity. Although the contamination reduction after phage treatment may be considered little, bacteriophages can remain viable and stable for long time periods at low temperature storage (Fiorentin et al., 2005; Guenther et al., 2009; Hooton et al., 2011). Due to the commercial storage conditions applied to seafood products, the growth of Salmonella spp. is greatly reduced or halted and the phage replication will be inhibited. However, bacteriophages can recover the replication in conditions of temperature abuse, or even exhibit a passive activity that cause reductions without the need for the bacteriophage to replicate and complete their life cycle (Hooton et al., 2011). Phages used for therapeutic applications must be carefully scrutinized to ensure that they are lytic phages. As lysogenic phages have been shown to enhance the virulence of pathogens, as in the case of 2 studies of phages against V. harveyi in shrimp (Ruangpan et al., 1999; Munro et al., 2003), the lysogenic phages should never be used in phage therapy. As we have already discussed about lysogenicity and rare occurrence of CRISPRs, so it is suggested that characterization of phage is highly needed before applying it as a therapeutic agent. From this study we could find that the Salmonella specific phage isolated from sewage can be used as a better biocontrol agent to reduce Salmonella in the PD shrimps than using any chemical agents which was kept at refrigerated condition. Even though the study clearly describes a significant log reduction in Salmonella count in PD shrimp using phage therapy, but it failed to show a complete Salmonella reduction. 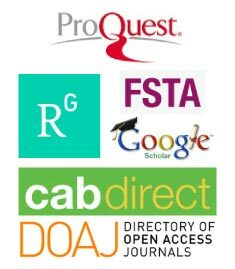 The authors gratefully acknowledge the Microbial type culture collection, Chandigarh for providing the pure bacterial strain and Kerala university of fisheries and ocean studies for all the assistance. Authors declare that there is no conflict of interests. Abedon, S.T., Thomas-Abedon, C. (2010) Phage therapy pharmacology. Current pharmaceutical biotechnology 11, 28-47. Adams, M.H. (1959) In: Bacteriophages. New York. pp: 120-145. Allison, G.E., Klaenhammer, T.R. (1998) Phage resistance mechanisms in lactic acid bacteria. International Dairy J, 8, 207-226. Badonia, R., Ramachandran, A., Sankar, T.V. (1988) Quality problems in fish processing. J Indian Fisheries Association 18, 283-287. Barrangou, R., Fremaux, C., Deveau, H., Richards, M., Boyaval, P., et al. (2007) CRISPR provides acquired resistance against viruses in prokaryotes. Science 315, 1709-1712. Carey-Smith, G.V., Billington, C., Cornelius, A.J., Hudson, J.A., Heinemann, J.A. (2006) Isolation and characterization of bacteriophages infecting Salmonella spp. FEMSmicrobiology letters 258, 182-186. Carlton, R.M. (1999) Phage therapy: past history and future prospects. Archivum immunologiae Et therapiae experimentalis- english edition 47, 267-274. Dalsgaard, A. (1998) The occurrence of human pathogenic Vibrio spp. and Salmonella in aquaculture. International J Food Sci technol 33, 127-138. Dewanti-Hariyadi, R., Suliantari, L.N., Fardiaz, S. (2005) Determination of contamination profiles of human bacterial pathogens in shrimp obtained from Java, Indonesia. Determination of human pathogen profiles in food by quality assured microbial assays 63. Fiorentin, L., Vieira, N.D., Barioni Júnior, W. (2005) Use of lytic bacteriophages to reduce Salmonella Enteritidis in experimentally contaminated chicken cuts. Revista Brasileira de Ciência Avícola 7, 255-260. Fujiwara, A., Fujisawa, M., Hamasaki, R., Kawasaki, T., Fujie, M., Yamada, T. (2011) Biocontrol of Ralstonia solanacearum by treatment with lytic bacteriophages. Appl environ microbiol AEM-02847. Guenther, S., Herzig, O., Fieseler, L., Klumpp, J., Loessner, M.J. (2012). Biocontrol of Salmonella Typhimurium in RTE foods with the virulent bacteriophage FO1-E2. International J food microbiol 154, 66-72. Guenther, S., Huwyler, D., Richard, S., Loessner, M.J. (2009) Virulent bacteriophage for efficient biocontrol of Listeria monocytogenes in ready-to-eat foods. Appl environ microbiol 75, 93-100. Hooton, S.P., Timms, A.R., Rowsell, J., Wilson, R., Connerton, I.F. (2011) Salmonella Typhimurium-specific bacteriophage ΦSH19 and the origins of species specificity in the Vi01-like phage family. Virology J 8, 498. Hungaro, H.M., Mendonça, R.C.S., Gouvêa, D. M., Vanetti, M.C.D., de Oliveira Pinto, C.L. (2013) Use of bacteriophages to reduce Salmonella in chicken skin in comparison with chemical agents. Food Res International 52, 75-81. Huss, H. (1994) Assurance of seafood quality. FAO. Karunasagar, I., Pai, R., Malathi, G.R., Karunasagar, I. (1994) Mass mortality of Penaeus monodon larvae due to antibiotic-resistant Vibrio harveyi infection. Aquaculture 128, 203-209. Elizabeth, K. (2009) "Phage host range and efficiency of plating." In Bacteriophages. Humana Press pp: 141-149. Leverentz, B., Conway, W.S., Camp, M.J., Janisiewicz, W.J., Abuladze, T., et al. (2003) Biocontrol of Listeria monocytogenes on fresh-cut produce by treatment with lytic bacteriophages and a bacteriocin. Appl Environ Microbiol 69, 4519-4526. Munro, J., Oakey, J., Bromage, E., Owens, L. (2003) Experimental bacteriophage-mediated virulence in strains of Vibrio harveyi. Diseases of aquatic organisms 54, 187-194. Ruangpan, L., Danayadol, Y., Direkbusarakom, S., Siurairatana, S., Flegel, T.W. (1999) Lethal toxicity of Vibrio harveyi to cultivated Penaeus monodon induced by a bacteriophage. Diseases Aquatic Organisms 35, 195-201. Sambrook, J. (2001) "Molecular cloning: a laboratory manual. (eds. Sambrook, J. & Russell, DW) A2” 2. Shabarinath, S., Kumar, H.S., Khushiramani, R., Karunasagar, I., Karunasagar, I. 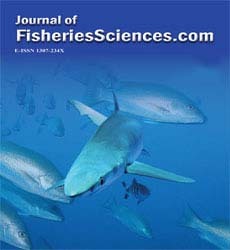 (2007) Detection and characterization of Salmonella associated with tropical seafood. International J Food Microbiol 114, 227-233. Skurnik, M., Strauch, E. (2006) Phage therapy: facts and fiction. International J MedicalMicrobiol 296, 5-14. Upadhyay, B.P., Utrarachkij, F., Thongshoob, J., Mahakunkijcharoen, Y., Wongchinda, N., et al. (2010) Detection of Salmonella invA gene in shrimp enrichment culture by polymerase chain reaction. Southeast Asian J Trop Med Public Health 41, 426-435. Zinno, P., Devirgilllis, C., Erolini, D., Ongeng, D., Mauriello, G. (2014) Bacteriophage P22 to challange Salmonella in foods. Int J Food Microbiol 191, 69-74.